GM Ashley mentors Parrilla and Robinson! WIM Jennifer Shahade has just written a beautiful piece on the USCF website. The story concerns GM Maurice Ashley's mentoring efforts with Medina Parrilla and Darrian Robinson, two scholastic standouts who will travel to Batumi, the Republic of Georgia for the 2006 World Youth Team Championship in October. 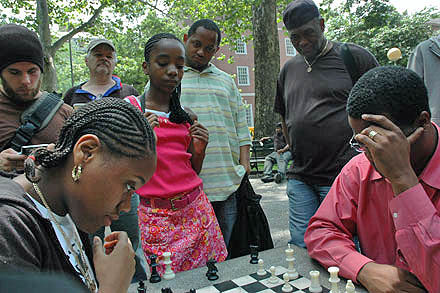 The story provides details of the meeting which took place in Washington Square Park, a famous watering hole notorious for chess hustlers. It was a momentous occasion for the two young stars both of whom will attract attention at the championships. 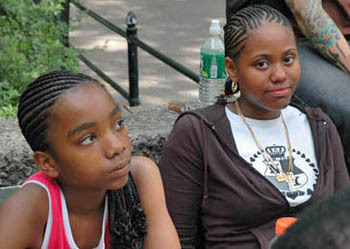 Medina (age 15) and Darrian (age 11), both with immaculately-coifed braids, no doubt were inspired by an afternoon with their famous mentor. Read Jennifer Shahade's story here! To donate to their cause, go here! Update (10-12-06)… New York Times story here!